Every now and then there is an invention for home interiors that leaves me gobsmacked. 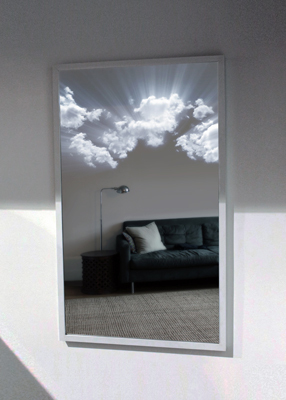 The Lucid Mirror by Brooklyn inventor, artist and designer Adam Frank is one of them. In all his inventions Adam uses a variety of techniques to bring “natural light” into today’s interiors. With the Lucid Mirror, he’s hit the ball out of the park. I’ve seen and interacted with this mirror in the flesh. And while the decorative mirror could seem a bit gimmicky at first glance, it seems to me that if you place this over a bathroom vanity – whether in a kids or adults bathroom – or have an extra large one in a luxury store such a Dior (can you hear me Peter Marino?! ), you really have something very, very special. 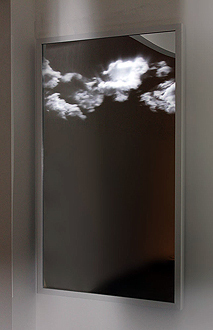 As you can see, there is a luminous 3d image of realistic clouds along the top and under the glass that are lit from behind making for the perfect illusion. The floodlit clouds can provide quite a fair amount of brightness, but this can be adjusted by using the built-in dimmer, so you can choose whether you want to leave the light on at its lowest setting as a bathroom night light or fine-tune it to any level to provide the perfect amount of light to complement your bathroom sconces or down lighting. It’s super!